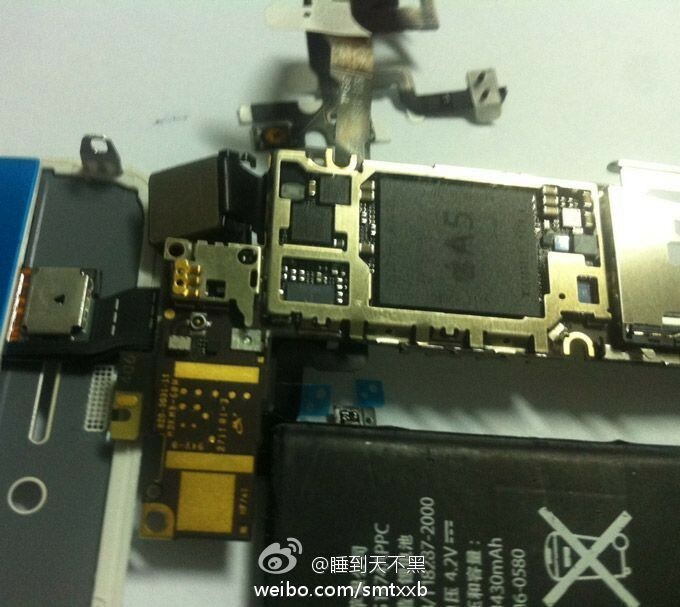 The image above was posted on Weibo, a Chinese Twitter clone of sorts, showing what is thought to be components of Apple’s yet to be released next-gen iPhone. Clearly showing the familiar Apple “A5” stamp, the chipset is mysteriously not from an iPad 2, and as Phone Arena points out, closer resembles that of the current iPhone 4’s A4 chipset layout. Curiously, the visible part of the battery reads “430 mAh”, which leads us to believe a similar battery to the iPhone 4’s 1420 mAh battery may be included in the next-gen iPhone. There is reason to be skeptical of these images. Apart from the overall blurriness of the shot, the A5 logo itself seems a little off and the source of the image cannot be confirmed. We still expect two variations of a next-gen iPhone to be unveiled late September and becoming available for purchase sometime around October 7th. You can get all the details here.